Torres del Paine and Bernardo O'Higgins National Parks, Region of Magallanes is part of the Tentative list of Chile in order to qualify for inclusion in the World Heritage List. 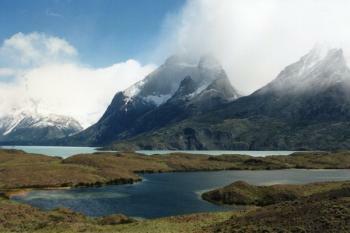 If you want to understand why Chile has so few sites, a trip to Torres del Paine is quite illuminating. This is the one iconic national park of Chile, printed on their 1000$ bills and known to hikers throughout the world. And they still haven't gotten around to submitting it. Torres essentially sits at the very end of the Andes, just opposite of WHS Los Glaciares. It has several steep mountains rising from large lakes giving a great scenery. Unfortunately, repeated fires in Torres caused by visitors have destroyed plenty of the local forests. The trunks of the trees bear witness to the destruction that took place. In addition the Bernardo O’Higgings National Park is also included. Getting to O’Higgings seems fairly difficult and requires planning and probably some money. I visited Torres on a day trip from Puerto Natales. Clouds were hanging on the mountain peaks, so I did not get to see the full vista. We hiked to Lago Grey, though, and I got a great view of the glacier and the lake. And I was blown away, literally, as the winds were so strong. I feel confident that this would be inscribed. The nature is amazing. Personally, I found Los Glaciares more accessible and less overrun than Torres. An argument could be made that this shoud be one WHS (Southern Patagonian Andes). Most trips to Torres del Paine will start from Puerto Natales. So Step 1 will probably be to get to Puerto Natales. While there seems to be an airport in Puerto Natales, most visitors by air arrive in Punta Arenas. Punta Arenas has flights to Santiago and Puerto Montt (Chiloe). The bus ride from the Punta Arenas airport to Puerto Natales is quite nice. You pass along the Magellan Straits through barren lands till finally the first hills and then the mountains of the Andes appear. Be sure to book your bus ticket online before you arrive (recorrido.cl, requires a PayPal account) as you may not get a seat otherwise. There are daily busses between El Calafate in Argentina and Puerto Natales. If you have money and time to spare you can take the Navimag ferry from Puerto Montt (4 days). The scenery must be amazing, but you don’t get off the boat to explore some of the landscapes; it’s not a cruise, but a means of transport. Multi day hikes are probably the best way to experience the park. The W as it’s called is a world reknown three day trail. If you are interested, there are plenty of online resources. In any case, plan well in advance (months for camping, nearly a year if you want to stay in a refugio). The park has become crowded and is operating at max capacity, so you will need to show a reservation for the camp sites to get in. 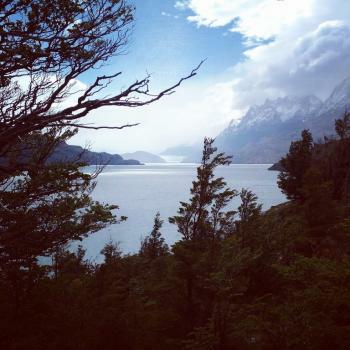 To get to the trail you can take a daily bus from Puerto Natales to Torres del Paine. Again, seats fill up quickly, so reserve for your trip in and out. In one direction you will probably have to take a ferry and the schedule, especially in off and shoulder season, is a major constraint. If you want to do Torres on a day trip, you are probably better off taking an orgainized tour. I booked mine (28.000$) via my hostel. Looking back I would have preferred different priorities with the itinary. We had a long lunch break and went to the Milodon cave. I would have rather done more hiking in Torres instead, but I am not sure a tour like that exists. Day tours can also drop you off and pick you up in the park, if the regular bus is too crowded. I have also seen day tours offered from El Calafate, but seeing how long it takes to get across the border with a bus full of tourists at a tiny border post in the middle of nowhere I would counsel against it. Finally, some do it via transitting between El Calafate to Puerto Natales, but again, this seems more stress than it's worth. Payne is not pronounced like pain. Instead: The ay in Payne is pronounced like the i mine. The e is pronounced: Torres del Pay-ne. I visited Chile in November 1995. From Puerto Montt, I flew to Punta Arenas, the most prominent settlement on the Strait of Magellan (due to its location and size it is sometimes considered the southernmost city in the world), and visited the nearby penguin colony at Seno Otway. From Punta Arenas, I visited Torres del Paine National Park, where I stayed at Hostería Pehoé, spectacularly located on a small island in a lake with views of the Cordillera del Paine, the park's most recognizable natural feature.